Summary: A simple application to help make forgetting your count a thing of the past. Works exactly as described on HTC Pure. an other suggestion: can you make it skinnable? then we'll make beautiful interfaces for your app. waiting for your updates! hi Ty G thank you so much, this is so far the best counter on wm! runs without problem on hd2. would you please make it multi so users dont have to save the result for each count? l hope it alows us to create a list and chose one of our counting works to continue, and even modify every count value on the list. thanks again! 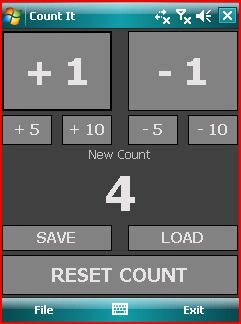 Good, but one thing; when we switch to other program we need to save or last count...is it no possible to let the last count on the screen. I was looking for a simple application to use a row counter for knitting. It is simple to quickly keep track of what row I am working on a pattern and if I have to put my project down I can save it and load it later when I get back to my knitting. Very simple and extremely practical. Im such a knitting geek! Actually as simple as this is, it is a much needed application. I am often in an environment wherein I need to keep count of people traffic (sheriff recruiting events). I always have my phone but do not always have my tally counter with me. This is perfect. I also like the ability to save and reload counts. Thanks and an awesome app!